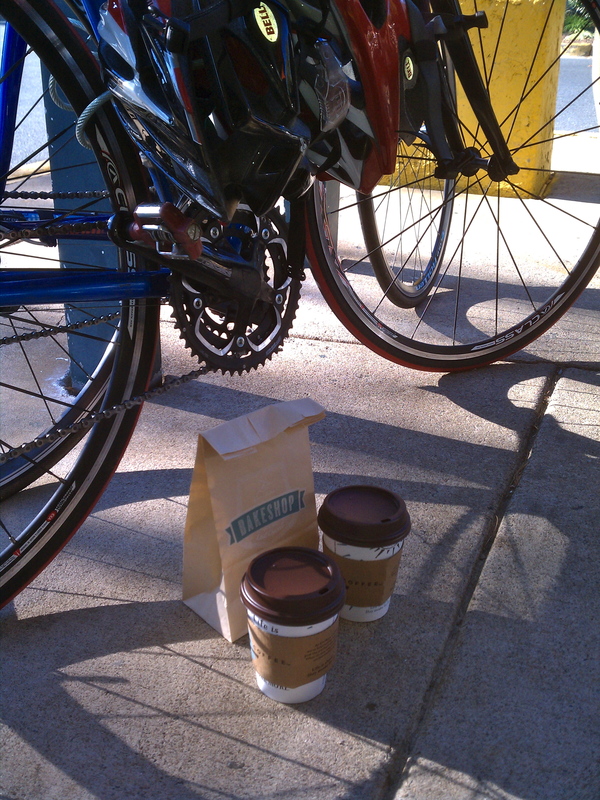 We can’t go into the weekend (THE FIRST WEEKEND OF OFFICIAL COFFEENEURING SEASON) without another example of how coffeeneuring happens. 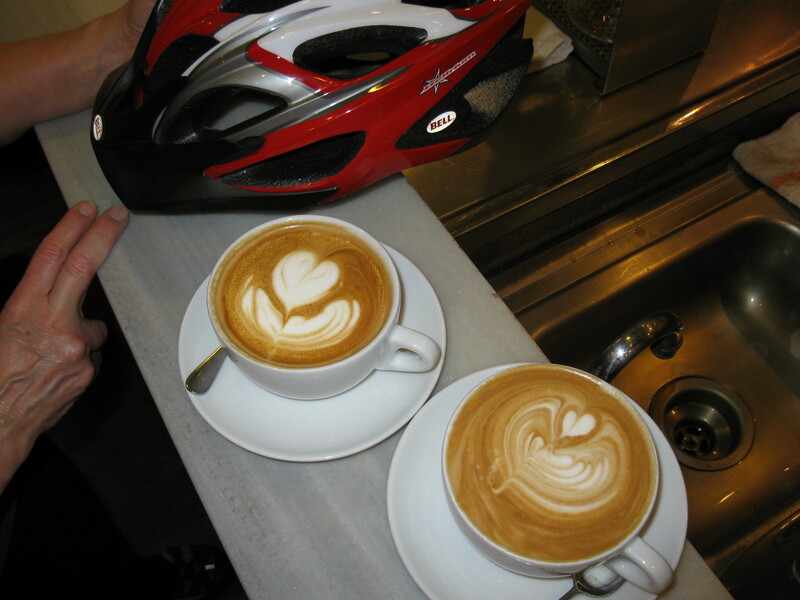 And, of course, it’s always nice to give the locals of #BikeDC and #BikeArlington a shout-out, especially ones who’ve taken such care with capturing their coffeeneuring images. 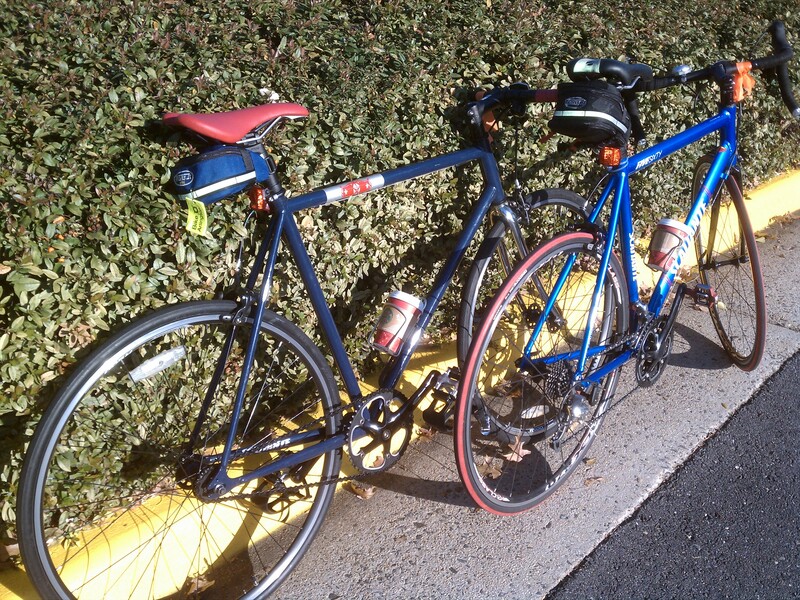 With that, I present you with the coffeeneuring rides of Mr. and Mrs. Bike Snick from this past year. Which bike: Fixed gear bicycle. I finally got warmed up on the way home. Although the outside temperature is in the mid 70s (F), our house is cold, 68 degrees. Mrs. Bike Snick is making 3 cakes (!) for a wedding today and the Italian buttercream frosting needs to be cool. Mrs. Bike Snick joined me on her road bike. We sat outside enjoying the newspaper and beautiful day. Mrs. Bike Snick joined me on her road bike. It was nice when the rain stopped. We enjoyed reading, splitting a piece of apple pie and sitting outside. Rode with Mrs. Bike Snick. This was our first time using CaBi. 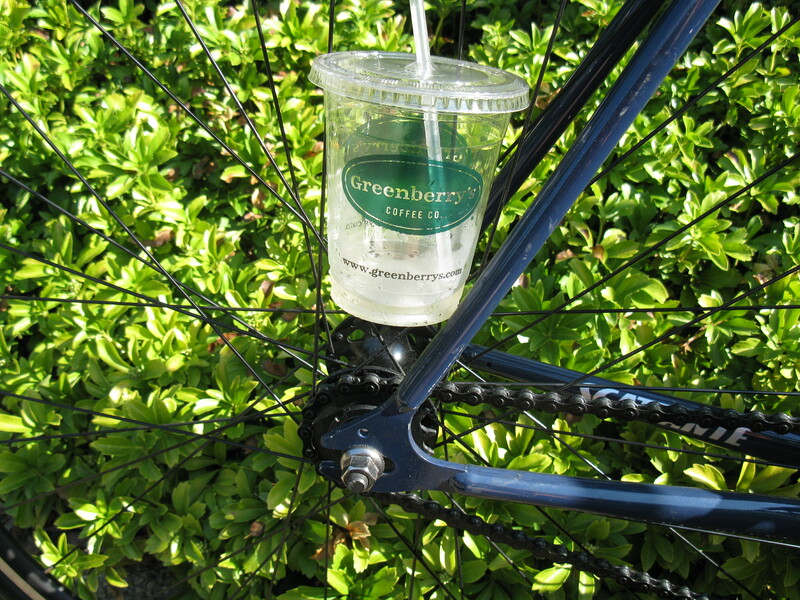 We had two free 24 hour passes from Bike To Work Day. The passes worked great and the bikes were easy to use. It was fun planning multiple hops that were less than 30 minutes. We saw Georgetown, L Street cycle track, the White House, Pennsylvania Ave cycle track, the Capitol, 11St Local Bridge overlook, Anacostia Riverwalk Trail, Nationals Park, and more. Rode with Mrs. Bike Snick on her road bike. 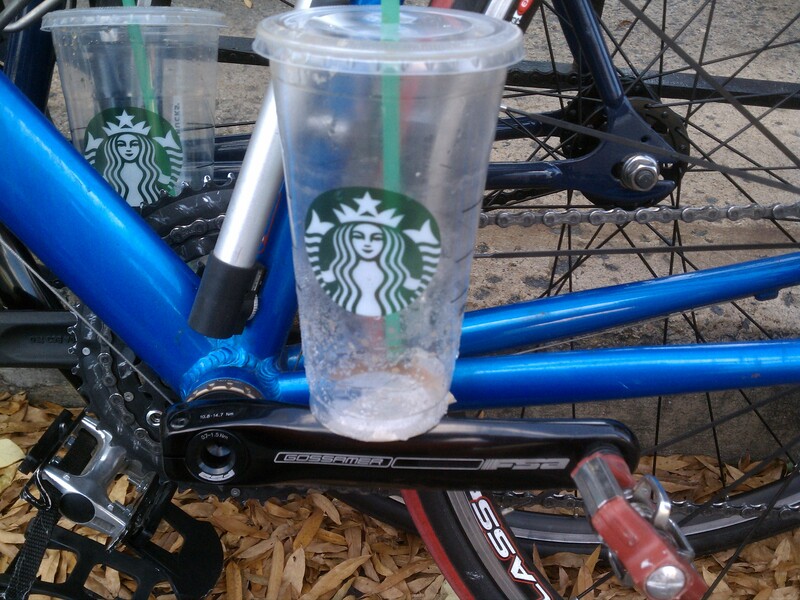 She has completed 4 coffeeneuring rides now and is enjoying it. It was cloudy and we felt a few sprinkles. On the way to coffee we stopped at CVS to get a picture printed. This was the topsy-turvy cake my wife made for a friend’s wedding. After coffee we picked up the prints. My wife joined me on her road bike. It was sunny and a great day for riding. We enjoyed sitting outside and reading some of the newspaper. Mrs. Bike Snick joined me on her road bike. It was mostly sunny, but very windy. The temperature was fine, but it was too windy to sit outside. 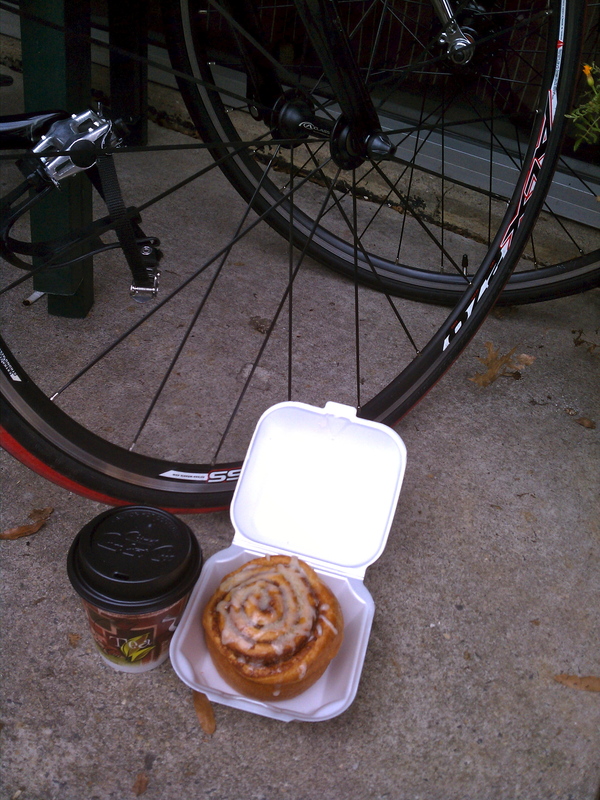 Mrs. Bike Snick joined me on her road bike; this ride completes her 7th coffeeneuring ride. 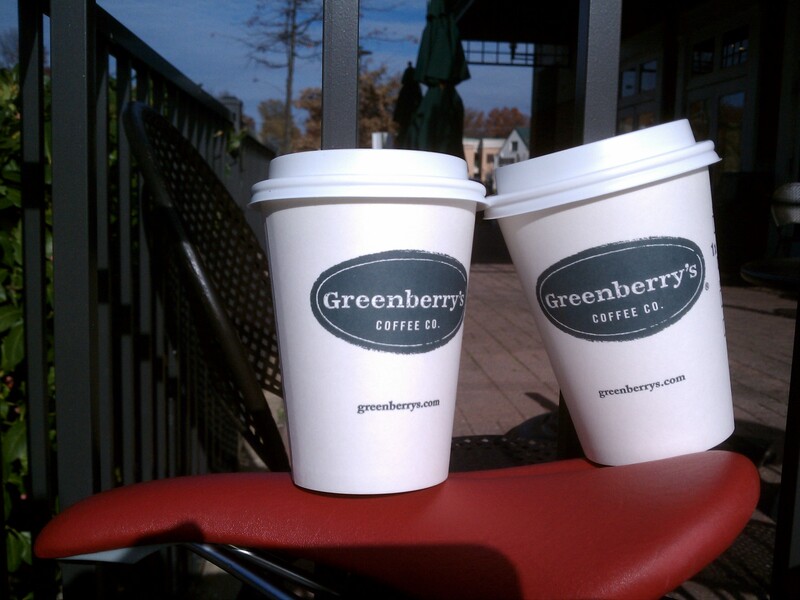 It was cloudy and windy, but we sat outside reading under Greenberry’s heat lamps – nice! The manager came outside to tell us two new bicycle racks have been installed across the street. These are among several recently added in downtown McLean. The racks will be dedicated later this week by Fairfax County Supervisor John Foust. Congratulations on completing the challenge, Team Bike Snick! 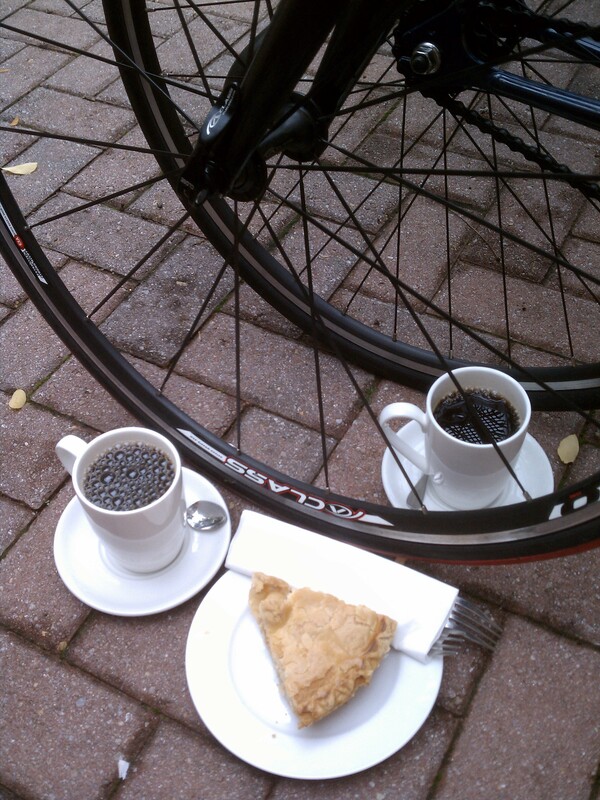 I hope you are up for another round of coffeeneuring. It all starts again October 4! MG, I saw this and thought of you : ) minipresso device http://www.wacaco.com I don’t know much about it other than the website. I’d need to research it more in depth and try it before recommending it but wanted to share.